Ice skating on the National Mall. 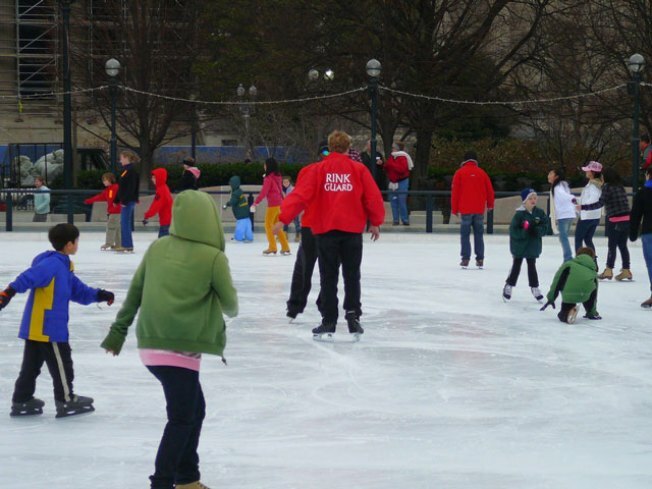 If you've been to the National Mall recently, you've probably noticed that the Sculpture Garden ice rink isn't ready for prime time skating. The rink usually opens in mid-November, but due to "technical difficulties" the rink has yet to open for the 2009-10 season outside of the National Gallery of Art. The rink's Web site said there is no timetable for the rink's opening, and a recording on the rink's voice mail says it may not open until after Nov. 30. An e-mail response from the Sculpture Garden provided more details: "The engineers are currently working on repairs to the coolant system. The best estimate for opening is 2 weeks." So until then, there will be no toe picks and twirls on the National Mall. However, Pentagon Row's ice surface has been in use since Oct. 30. The rink has seen about 1,000 on weekends, and if you time it right, you can skate in an Arlington snowfall. That's right, the rink staff has hooked up a snow machine next to the rink, creating an artificial snowfall each night from 7 p.m. to 7:10 p.m.
Who knew there was a winter wonderland in our own backyard? For those in Maryland who don't want to travel all the way down to Virginia, there's another outdoor rink in Glen Burnie that has been open since Oct. 29. Go grab some rentals and take your life into your own hands under the stars.